The Westpac Rescue Helicopter TV Commercial is the first project completely mixed in Apple’s Logic Pro 9 at The Film Bakery. Having worked in radio briefly before getting into the camera department at a TV station, I’ve always retained an affection for sound and mixing in particular. Until Soundtrack Pro came bundled with Final Cut Studio, there was a big gap between mixing as best you could in your editing application and handing the files over to a traditional sound studio. In many ways, my experiences with sound studios over the years has been similar to my relationship with colour grading suites. I’ve always felt privileged to have a front row seat when watching a great mixer or colorist in full flight, and yet I always wanted more time, more freedom and a more direct connection to the material. 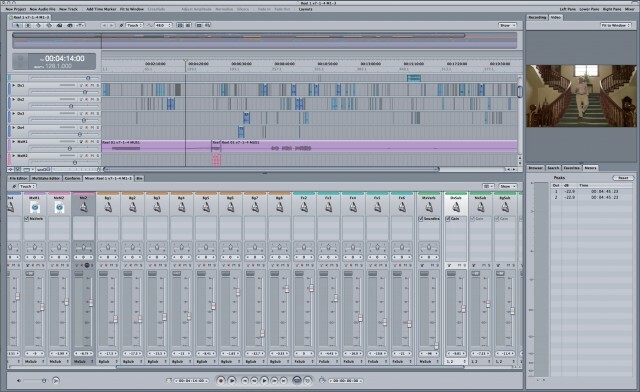 Soundtrack Pro really changed that landscape for us in 2005 by making in practical to create a full mix on the same machine we were using for editing. Over the next few years The Film Bakery came to depend on STP for it’s ability to take complex track layouts from Final Cut Pro and build them into a sophisticated mix with realtime, EQ, Compression, Reverbs, Mix Automation and Sub-Mixes. Usually the workflow was an XML out of FCP was brought into STP, a Quicktime Video was attached and the the mix saved as an STP Project then returned to FCP as either a single AIFF or a series of AIFF Sub-Mixes depending on the requirements of the project. This workflow served us well for a wide variety of projects, most recently the feature film McLean’s Money and the feature documentary From The Outback To The World. When Soundtrack Pro reached it’s end-of-life as a product, we began researching options for a replacement DAW software to move towards. Avid’s Pro Tools in the undisputedly dominant player in audio post production and Apple barely even promotes Logic Pro as an audio post package. Despite this, our research has led us to the point where we decided that Logic Pro is actually the best DAW software for The Film Bakery right now. The big reason for this is very simple, we would have to chose between the likelihood of running out of tracks on long-form projects if we went for a basic Pro Tools option and having a more expensive system idle while working on other parts of the production process if we went for a Pro Tools HD system. Logic Pro gave us all the tracks and buses, effects and video sync we needed at a very workable price. But how would it actually function in a real mix? When we recently needed to do a slight remix from the sub’s on McLean’s Money it became an initial test case. Working from the existing sub mix files the track setup was very straight forward, laying in the additional FX and music worked smoothly and the video held sync perfectly throughout the film. The only hiccup was when I came to output the finished mix (in this case a Stereo AIFF) I kept getting a warning that the 102 minute file would exceed the program’s 2 GB file size limit. Okay I thought, this is just for a preview DVD, so I changed to a compressed AAC file… and same message. Odd. Even a highly compressed Mp3 delivered the same error message! After much searching through Logic Pro’s 1,326 page users manual, I discovered that during mixdown Logic first creates uncompressed PCM files, irrespective of the final output format. The easy fix for this was to output separate left & right channels by changing the File Type in the bounce menu from Interleaved to Split. These could then easily be easily synced in FCP for final output with the video. This process would also work with Surround, by splitting each channel to a separate file. Having conquered these little issues was was clearly time to try a full mix from start to finish in Logic Pro and along came a perfect test case in the form of a charity ad for the Westpac Rescue Helicopter Service. As Director/Editor Clara Chong worked on the picture edit, she also built up many layers of music, voice and sound effects in the FCP timeline. This allowed for the soundscape to build with the vision edit. Track Laying in the Final Cut Pro Timeline. You can see in the image above, there were 40 Mono tracks in the timeline, including a few with discarded elements and blank tracks for housekeeping in FCP. Within FCP Clara adjusted the volumes levels only to get a rough working mix. From the Final Cut Pro timeline we exported an OMF (without Levels, Pan or any other adjustments) which then imported directly into Logic Pro 9. Because FCP (up to v7) only has Mono audio tracks , each channel comes into Logic Pro as a separate Track and Mixer Channel. Logic itself can easily handle Stereo or Surround tracks and channels so my first task was to simplify the environment by using the Bounce Region facility to turn all of the Dual Mono Clips into Stereo Clips on Stereo Tracks. This is achieved making sure the Tracks are Panned correctly in the Mixer, then highlighting both channels of the clip and then clicking the Bounce Regions button towards the top right of the Logic Pro Arrange window. Bounce Regions gives you the option of placing the bounced audio on a New Track or the Currently Selected Track. I used both of these options on various elements. I wanted each of the musical elements to be on their own track, so that I could tweak levels and plugins without having to consider the effect on other elements on the same track. This was the same with the helicopter Sound FX where we had 10 different helicopter sounds, mostly recorded on location, but I wanted to be able to treat each of these elements separately because the sounds at each stage of flight were so different and they worked so differently with the voice & music elements. 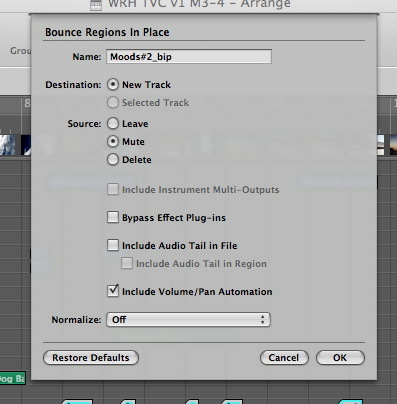 In contrast, the beach FX (from Apple’s FX Library) were all on the same track by selecting New Track for the first clip and then selecting that for each other clip and changing the Bounce Destination to Selected Track. The other option in the Bounce Regions dialog box is what to do with the source clips. This can be Leave, Mute or Delete. I chose to Mute, so that the clips remain in place on their original Tracks but were muted. This way I was able to check that everything was working before then going through and deleting all of the Tracks with the unused Clips. 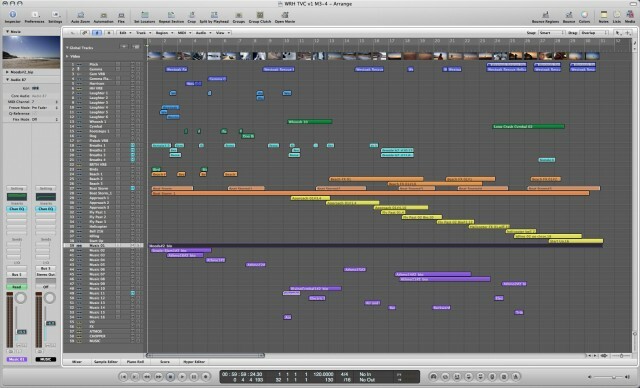 Logic Pro treats the Arrange Window (ie. the multitrack recorder) and the Mixer Window (ie. the mixing desk) as quite separate, yet tightly integrated entities. For example, you can colour code both Clips on Tracks and the Mixer Channels they related too… but these can be either matched or different. For production mixing there is a lot of value in matching these, but it is also useful to be able to identify a Clip that might be different for some reason by a different shade of the Track Colour. The colour options are much more varied than in Soundtrack Pro and I found this to be very useful. Within this I use different shades for variations, eg. in this mix I used different shades of blue for the voices, laughter and breaths and put these on separate Tracks. As someone who is very conscious of colours, I find this colour scheme allows for a good range of variations and a clear overview of the different components of the mix. 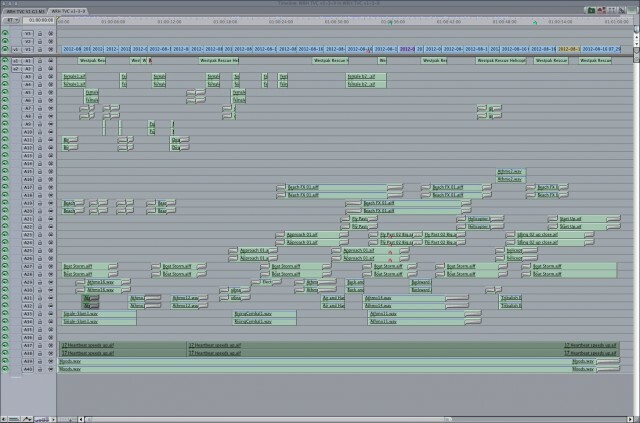 Then all of the Tracks and Channels are grouped together in the above order. I’ve experimented with variations on this but have found it to work the best in most situations. Because the sounds of the Rescue Helicopter were such a big part of this mix, I broke them out into their own group and coloured them Yellow (for obvious reasons!). This was then routed to it’s own SubMix. 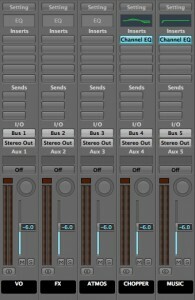 In Logic Pro a SubMix is created by connecting the output of a Track to a Bus and then making that Bus the input to an Auxiliary Channel on the Mixer. In this context you can think of a Bus like a patch cable with one end connecting to the output of the Mixer Channel and the other end connecting to the input of the Aux Channel. The Aux Channels is Logic can serve a wide variety of purposes, but for production audio mixing the SubMixes are essential. They allow you to quickly turn entire elements of the mix on and off. For example, when tweaking the FX and Atmos Tracks, I find it very useful to be able to turn off all the voice and music Tracks to get a feel for where all the elements are. These SubMixes also make it easy to output separate SubMix audio files which can then be used for tweaking or revising the mix down the track, without even being tied to Logic Pro. If the client decides in a year’s time that they want to change the voice over and we’ve changed to a different mixing platform by then, no problem… we’ll just pull out the SubMix files, replace the VO and do a new mix down. On some projects the SubMixes give you a final, simple way to tweak the mix by working only with the grouped elements. On this project we didn’t find that necessary for fader levels but found it immensely helpful with the overall EQ of both the Chopper and the Music. Because we had 10 Tracks of Chopper FX and 16 of Music Elements, this was a very efficient way controlling the character of these sounds after each Track had been worked on individually. In the Mixer, the output of each SubMix was then routed to the Stereo Output and this process would work the same for a Surround Output. Although Logic Pro has plenty of capacity for layering up FX Plugins on the Mixer Channels, there are times when it makes sense to send the signal from the Mixer Channel to another Mixer Channel (an Aux). This can facilitate adding the same effect to several different Tracks at the same time, but it also allows you to ride the levels of an effect using the Aus Channel’s Fader. On this project we used 4 Aux FX Channels to add Reverb and it was for both of these reasons. Creating an FX Aux Channel can be done by simply clicking on one of the blank buttons in the Sends section of any Channel Strip on the Mixer and selecting a Bus. Because the first five of ours were used for the SubMixes, the first one available for an FX Send was Bus 6 and this was allocated to the main voice over by Gemma Dawson who plays the mother both in the visuals and in the sound. Immediately to the right of the newly lit-up Bus 6 button is a small round dial which controls how much of the signal from the Audio Channel is sent to the FX Aux. This can be useful if you want to have Tracks feeding into an FX Aux at different levels. Clicking on the Bus Button also gives you the option of the signal being sent from the source Channel either before or after the Fader level or after the Pan control. At this point it was also important that I change the Output side of the I/O section (below the sends) from Stereo Output to the appropriate SubMix, in this case Bus-1 (VO). For our purposes we wanted all of the Tracks that were going to an FX Send to be at their Post Fader level exactly, so I left the Send set to it’s default Post Fader option and double-clicked the Send Level Dial to get the numerical input and set it to “0”. Selecting this new Bus Send also automatically created a matching Auxiliary Channel Strip at the far right of the Mixer, just before the Output Channel Strips. The first thing I did with each of these is right-click anywhere on the Channel and select the Create/Select Arrange Track option. Choosing the Create/Select Arrange Track option also creates a corresponding track in the Arrange Window and the main use for this is to access the Automation Data for that Aux Channel. This means that the Aux Track can be dragged to a different position in the Arrange window and when the Mixer is in Arrange Mode (normal) this is mirrored in the Mixer window. In the case of the VO Reverb is the screen grab on the right, this means that the Fader controlling Gemma’s Reverb is sitting right next to her main Fader Channel. This makes for a much more orderly layout and avoids going from one end of the mixer to the other to move between the main Channel and the FX Channel associated with it. With the Aux Channel’s Fader still at the default 0dB Level and the Automation Mode (above the VU Meter & Pan Pot) set Off I added the Reverb Plugin. In this case I used the GoldVerb because I find it has a good clean sound and a nicely straightforward interface. I increased the room size (48 metres) and made the Wet/Dry mix 100% so that this Channel was only outputting the Reverb Effect and none of the original sound. This is because the unaffected sound is still travelling directly to the VO SubMix and we wanted the Aux Fader to only control how much Reverb is mixed into the Submix. Then playing the mix I adjusted the Aux Channel until I heard an amount of Reverb that I was happy with as a starting point. For some Channels this was just quite a high level and for others like the Main VO it was none at all. Everything was then ready for the Mixing stage of the process where I could use Automation to adjust the level of the Reverbs continuously and intuitively throughout the mix. All for 1 minute of screen time. In most sound mixing Equalisation & Compression are vital tools and no less so in Film & TV mixing. One of the things I like about Logic Pro 9 is that any Channel on the Mixer that has the Channel EQ as an Insert Effect (plugins applied directly to the Mixer Channel) displays the EQ curve on a display at the top of the Channel Strip. The thing that’s great about this if you’re coming from years with Soundtrack Pro is that one of the most common things you do in a mix is apply and tweak the EQ and here it’s a simple matter off double-clicking that graph to add or adjust the EQ. It also means that a quick skim across the mixer reveals very clearly, which Channels have EQ applied and an overview of what it’s doing. In this mix we tended to avoid too much compression, which is a little unusual for a commercial, but not at all for drama. I tried adding some Compression to the Output Channel but we even found that this was taking some of the air and drama out of the mix. The main use of Compression was directly onto Gemma’s main voice over track, after the EQ. 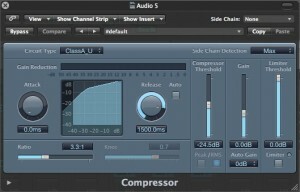 I found this was helpful in getting the EQ to do as much of the work as possible before hitting it with the Compressor. It’s worth noting that most of the plugins in Logic, including the EQ’s & Compressors, are identical to the ones in STP. For me, this was another big plus of migrating to Logic, compared to learning a whole set of new (even if excellent) tools in another DAW. I settled on a Class AU compressor for Gemma’s voice. I’m afraid I don’t know enough about the hardware compressors that this is modelled on but with a bit of experimentation I’ve found that I like the way the Class AU handles female voices and Gemma Dawson has such a soft, feminine timbre I felt the Class AU was a perfect fit. For male voices I usually end up using the VCA which seems to retain a bit more masculinity at the expense of a bit of warmth. I set the Attack to “0” and a very slow Release, which combined with a pretty low threshold meant that the Compressor was affecting pretty much the whole of the recording. Because we had a nice, clean recording of Gemma in the voice over booth at Concept Creative, I didn’t need to worry about excluding noise or bounce from the compressor. After going back and forth quite a bit on ratio settings, we eventually set it at 3.3:1. This is a pretty low ratio for a TVC voice over, but any higher and we felt we were starting to lose more and more of the subtlety of Gemma’s performance. I chose to use the Auto Gain feature, not to get a constant level in the final mix, but just to have a neutral staring point to start mixing her level based on the emotional and performance cues in the read. It’s really not that long ago that a good TV post production mixing studio meant a 24-Track tape machine and an analogue mixing desk. I’ve watched many times as an experienced mixer’s hands would fly around the desk during the mix-down as they manually adjusted faders and EQ’s in real time. Just being able to get your hands on the right control at the right time was an art form in itself, let alone getting the settings right! The great luxury of mixing entirely “in-the-box” ie. digitally within a computer is that you can control and automate one element, even one moment at a time. With 59 Faders in this 60 sec. mix, Automation in-the-box was something I was very grateful for! I used the PreSonus FaderPort control surface to drive the mix and you might want to read my review of this great little unit. 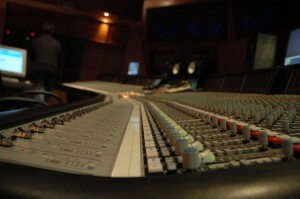 On an automated mixing console, like the SSL unit pictured, sensors detect the position of each fader in and are able to replay the mix without the operator needing to control the fader. This frees the mixer from needing to perfect each channel in the same pass. On a touch sensitive desk, this goes one step further and while playing back in “Touch” mode the operator can touch a Fader and record new automation data, then as soon as the Fader is released, the motors take over again and return to playing back the existing Fader moves. This is great for fine tuning a mix, where a Track may be almost right but just needs little changes here and there. The Automation in Logic Pro functions a little differently to Soundtrack Pro and although I was caught out by a couple of things initially, I quickly came to appreciate the differences. The first difference to bite me was the realisation that while Soundtrack Pro only records a few specific parameters in Touch mode, Logic Pro records just about everything. Yes, all my fiddling with EQ settings while playing back Gemma’s VO were being faithfully recorded by Logic! Wild oscillations in the EQ settings, accidentally recorded in Logic Pro! This led directly to discovering the second major difference between Automation in Soundtrack Pro and Logic Pro – in STP there is no “Off” mode in the Automation, just Read, Latch and Touch. I assumed, perhaps stupidly, that the Off mode in Logic simply related to the physical Faders on an external control surface but instead, the Off mode turns off the playback of any Automation settings for that Track. At first this seems a pain, but then I realised how great it is. It allows you to turn off the Automation and just play with the mix, without deleting anything you’ve already done. OFF – Default, no Automation settings are recorded or played back. Almost like adjusting the Faders on a non-automated analogue console where there is no direct connection between the tape deck and the mixing desk, apart from sound. WRITE – Records pretty much everything you do. TOUCH – Records pretty much everything you do, but then goes back to Reading when you stop fiddling. LATCH – Is like Touch, but keeps going. READ – All Automation is played back, but can’t be changed. In the Automation Preferences, you can also go in and select what parameters are controlled in Touch mode and I’ve now removed Plugins and Mute from the list, knowing that I can turn it back on when I need them. More often than not I want to tweak them on the fly and then go with the end result. The other big, but obvious difference to STP is that Logic Pro Automation Modes are selected Track by Track, instead of globally. Once again, this is a good thing as it allows you to “lock off” one Track by switching it to Read mode while you focus on another Track in Touch mode. You can see in the screen capture above that the main music Track trends to a lower level in the second half of the mix, this makes room for the important sound of the helicopter itself to be a big presence in the mix. The video below shows the mixer automation some of the Voice & Laughter Tracks including the Reverb Channels rising and falling. One thing that is quite effective in Soundtrack Pro is the ability to very easily add an effect to a clip or even a part of a clip. I’ve been using this a lot with actor’s dialogue to go in and use Pitch Shifter II to slightly change the inflection of a line or even a single word where the actor has briefly fallen out of the moment. This can be an incredibly powerful tool can sometimes turn the performances in a scene from being almost there to being just right. For those final 3 lines I wanted to give Gemma a bit more gravitas by lowering the pitch just a little bit. Now, there may be another way of doing this but this is the workaround that I settled on, and it is quicker than taking those lines out to STP or another piece of software. The VO Tracks showing the Pitch Correction Track and Bounced Regions back below on the Main Gemma Track. I moved the three voice over clips I wanted to tweak to an empty track above the main VO Track and then copied the EQ & Compression across. This is another big improvement over STP in that the parameters of any plugin can be easily copied and pasted between tracks in the plugin’s interface window. Pitch Shifter II window showing settings. 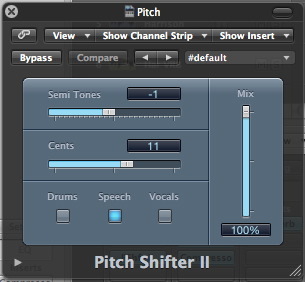 I then added the Pitch Shifter II plugin to the new track. Because I wanted to tweak the pitch line by line I adjusted initially only for the first line, then turned off the EQ & Compression (so that they weren’t bounced also causing a double dose) and then used Bounce Regions, selecting the Main VO Track to bounce it back to it’s original position but with the pitch correction added. This was then repeated with the other lines, switching the EQ & Compression back on, adjusting the pitch using the Semitones & Cents, then turning those off to bounce back into place. In the bounce I chose to leave the originals muted but still in place on the pitch track in case we decided later to tweak again. Altering the pitch of speaking voices is a delicate operation, on some lines you can go a long way and not so far on others. There is a point where it definitely sounds artificial. Up to that point, I find it to be a very powerful tools to alter the audience’s perception of a moment, much the same as using a cutaway or holding a moment longer in video editing does. Once we were happy with the Voice Over that forms the backbone of the mix it was time to start giving the Music & FX Tracks a boost whenever it felt right. This meant pushing the music when there was space early in the ad but then later giving priority to the arrival of the Chopper. When Clara designed the sound layout in Final Cut Pro, she recorded and added sounds of the mother breathing to add intimacy and tension. However, as we got further into the mix we experimented with turning these off and on at different times. In the end we found the cleaner sound of removing the breaths worked better. Another big moment in the story and the visuals is when the helicopter flys directly overhead and we wanted this to be a powerful moment in the soundtrack as well. I big boost in the EQ and volume as the chopper reaches it’s closest point was part of the solution. With this in place I also added a little pan automation to really differentiate the sound of the helicopter in the crowded sonic space. Starting with the pan at -23 to the left and then at the moment of the fly over I dragged it around to manually to what ended up being +7 to the right. By this stage we were very happy with how the mix was sounding and working with the pictures. As a final little polish, a bit like the way French chefs toss a little extra butter into the pan at the last minute, I decided to use the fact that Logic can automate anything to add another layer of EQ on the VO, Music and FX and to tweaks some important frequencies at certain moments in the mix. For the Voice Over, this meant giving it a little boost on the 3900 Hz band when I felt the voice needed a little extra clarity and a slight boost on 200 Hz on to add a bit more warmth to the end of the line “because they’re the ones who can”. To balance this out and gain a little extra separation, I then did passes on the main Music Track and the Chopper SubMix to drop the 3900 Hz band when the voice is present bringing it back to neutral to maintain the clarity of those tracks the rest of the time. For this purpose, I found the round dials of the Fat EQ easier to get a handle on in real time. This screen capture shows the 3 EQ windows playing back together. After a bit of research I discovered that Logic’s internal 32 bit processing has quite a bit of headroom on levels. This is great because it means you can happily mix away until things sound right without constantly worrying about the VU meters. Although it’s still a good idea to aim for everything working at healthy level, you can let the occasional peaks go by if they sound right and then set Normalisation to “On” when you’re Bouncing the final mix and this will adjust everything in unison so that the loudest sound is just below peaking. Normally in a digital system any peaks are cause for concern but this system works very well and saves a fair bit of effort manually adjusting everything in a big mix. 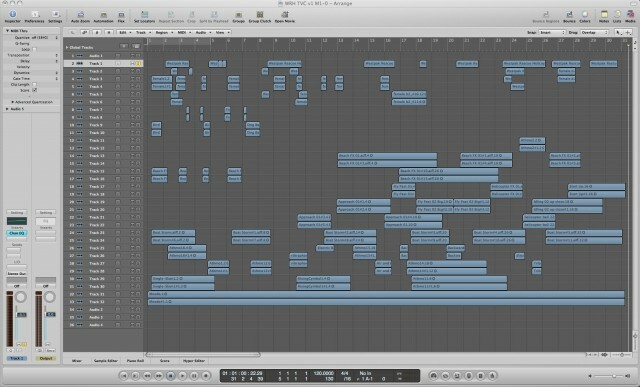 All in all, the experience of doing a complete mix in Logic Pro has been a thoroughly enjoyable one. The freedom and precision is great and the capacity to build a complex soundscape with so many layers coming and going with full automation is immensely satisfying. Having the opportunity to really go for a big, richly cinematic feel on a 60 second piece is also a wonderful thing. You can download the full project and media for the Logic Mix. Feel free to look at how we’ve done things and have a play with your own take on it!